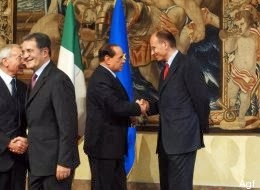 UPDATE (18:15) - Silvio Berlusconi has just come out of a meeting with MPs and Senators from his party. According to reports in the Italian media, he has outlined the following roadmap: a quick vote on the 2014 budget and a couple more economic measures (Berlusconi apparently said this can all be done in one week), followed by snap elections. Not sure this can represent a good basis for a potential compromise with Enrico Letta's centre-left Democratic Party - not least since Berlusconi's strategy seems to imply a return to the polls without changing Italy's controversial electoral law first. We explained in our original blog post from this morning why this could be a huge gamble. UPDATE (15:45) - Italy's Minister for Relations with Parliament, Dario Franceschini (from Enrico Letta's party) has just confirmed that the Prime Minister will address the Italian Senate on Wednesday morning and the Chamber of Deputies on Wednesday afternoon. 2) If, based on the statements made by the various political groups during the debate on Wednesday morning, Mr Letta were to deem the confidence vote in the Italian Senate absolutely impossible to win, he may decide to skip it and tender his resignation straight away. For regular readers of this blog (see here, here and here), Silvio Berlusconi pulling the plug on Italy's fragile coalition government was just a matter of time - especially after his conviction for tax fraud. On Saturday, Il Cavaliere ordered ministers from his party to resign and called for snap elections. The official reason for doing so was the Italian government's inability to scrap a VAT increase planned by the previous technocratic cabinet led by Mario Monti, due to kick in tomorrow. However, it would be naïve to see no correlation with the fact that Berlusconi is to be ousted from parliament within the next few weeks as a result of his tax fraud conviction. So what happens next? The moment of truth will be on Wednesday, when Prime Minister Enrico Letta will seek a vote of confidence in both chambers of the Italian parliament. The key vote will be the one in the Senate, the upper chamber, where Mr Letta's centre-left Democratic Party does not command a majority on its own. Tough, but definitely not unrealistic. Letta needs around 20 Senators from either Berlusconi's party or Beppe Grillo's Five-Star Movement to break ranks and support him. Over the past few days, politicians from both parties have hinted at possible defections. Crucially, after tendering their resignations, four of Berlusconi's ministers have expressed reservations over their leader's decision to open a new political crisis at this stage. All this suggests Letta does have a chance of winning the vote in the Italian Senate, and staying in power with a different, albeit thinner, parliamentary majority (and after a rather substantial cabinet reshuffle). However, this would only be a temporary fix. With his new majority, Letta could try and address a couple of urgent issues (a reform of Italy's tortuous electoral law and the budget for 2014 are the most obvious) - and perhaps plan for early elections at some point next year. If Letta loses the confidence vote, he will have to resign. As we explained several times, the ball would then be in Italian President Giorgio Napolitano's court. Napolitano would have to hold talks with all the political parties and then make a decision: task Letta himself or someone else with forming a new government, or dissolve parliament and call new elections. New elections in Italy can take place no less than 45 days after parliament is dissolved. The risks of a quick return to the polls are obvious. Voting again with the same electoral law may well lead to another inconclusive outcome - meaning that Italy could be facing a few months of political paralysis at a time when the country can least afford it. As if things were not complicated enough, the electoral law is currently also being examined by the Italian Constitutional Court, with a ruling expected in early December - and is at risk of being declared at least in part unconstitutional. This is where we are at. Clearly, none of the two scenarios would provide the medium-term political stability Italy needs to get its act together - which in itself is not great news for both the country and the eurozone as a whole. Everything will depend on how Wednesday's vote of confidence goes. Follow us on Twitter @OpenEurope and @LondonerVince for all the updates. But it’s not going to be an easy ride. 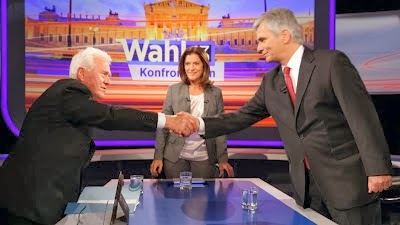 Posing a significant challenge, for example, is the euro-critical and anti-immigration Freedom Party (FPÖ), which is polling at 21% – in the last parliament it got 17% of the votes. Meanwhile, the Green party is polling at 14% and the newly-formed free market, anti-euro ‘Team Stronach’ is polling at 7%. 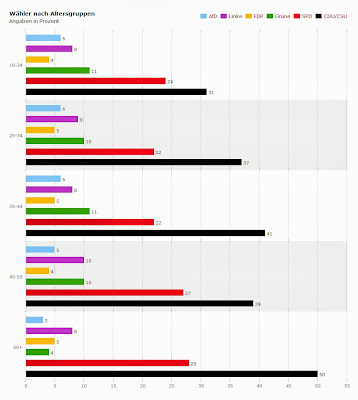 The BZÖ, a far-right split-off of the FPÖ, polls at about 2 - 3%, and in the last election won a staggering 10.7% of the vote (see table below). Most election-watchers believe a continuation of the current coalition is the most likely oucome. (One Austrian polling analyst gives this a 76% chance). But the result will also be dependent on how many of the smaller parties make it over the 4% parliamentary threshold. The two main parties could also turn to the Greens to prop up their coalition. 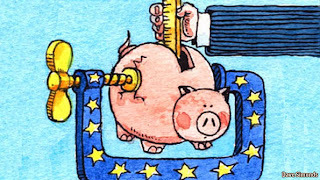 Having said that, the Greens oppose the EU's Fiscal Treaty, which may throw a spanner into the works. So the more interesting element of this election, then, is that about 30% of Austrians are projected vote for the FPÖ, Team Stronach and the BZÖ: all parties who officially support the break-up of the eurozone . The FPÖ, supports an Austrian exit from the eurozone and a referendum on the eurozone bailout fund ESM. The BZÖ, supports Austria leaving the euro and joining a Northern eurozone with Germany, France and the Netherlands. Team Stronach, founded by Austro-Canadian billionaire Frank Stronach a year ago, has done some flip-flopping on the euro. It initially floated the idea of eurozone countries having their own currencies, with the euro as a parallel currency. 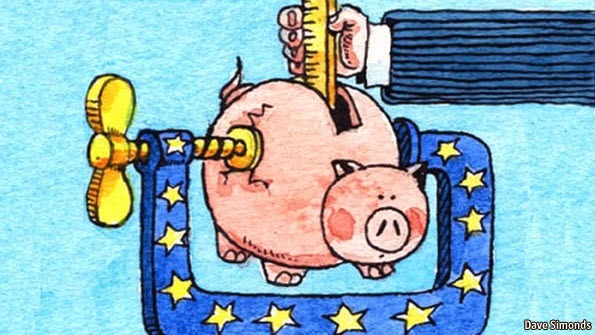 But now, the party's manifesto states that it wants to “revise, abolish or reconstruct” the euro. In its own words, it has an "explicitly eurocritical position,” and that “the artificial unification of Europe has failed.” It’s won over 10% in regional election – not so bad for a newcomer. Similar to Germany, a grand coalition government would mean no big shift in Austria’s eurozone policy. So the real significance of this election, then, is that in Austria –a nation whose economy is key to underpinning the euro – almost a third of voters want to leave it behind – or at least vote for a party that does. For additional analysis on the Austrian National Election see a blog post by our partner organisation, Open Europe Berlin. 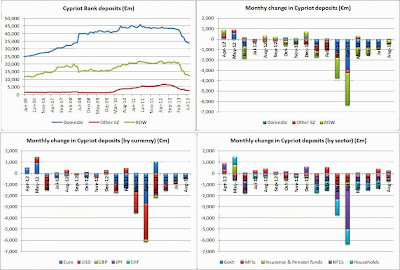 The latest Cypriot deposit data is out and it shows some stabilisation in bank deposits in Cyprus. 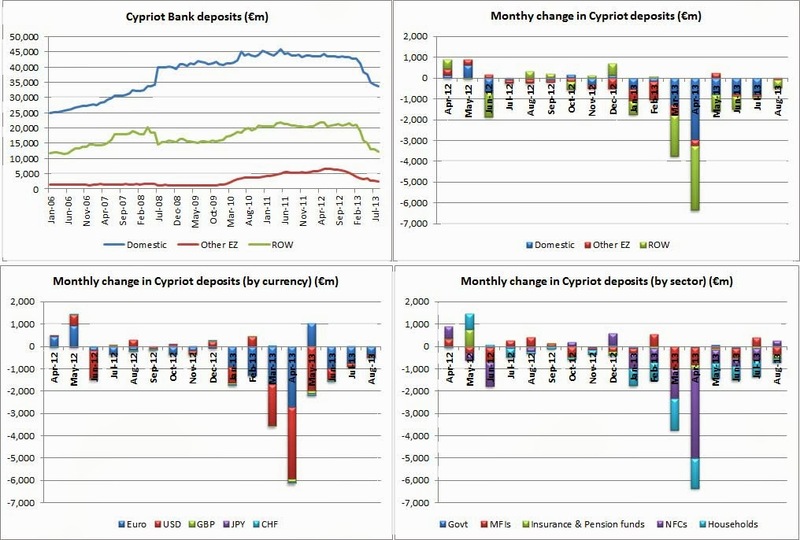 According to the data total deposits decreased by around €460m in August, although much of this was down to the conversion of 10% of unsecured Bank of Cyprus deposits into equity. As we have always said, the real test will occur when the capital controls are finally removed, which is due to happen at the start of next year according to the Cypriot government. 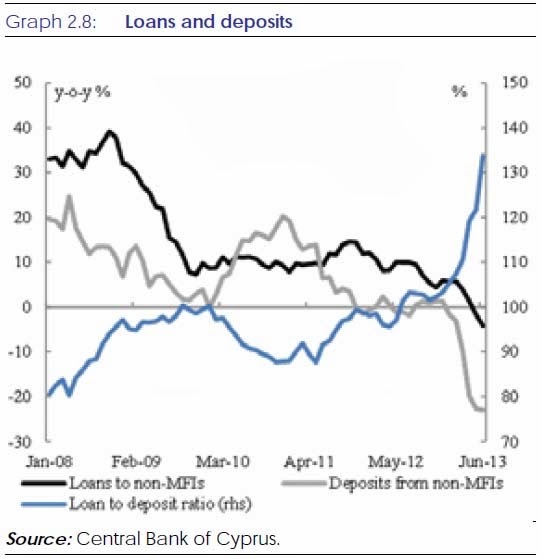 There is also one other concern (in terms of bank deposits, there are many concerns when it comes to Cyprus generally) – as deposits have fallen the Cypriot banks loan to deposit ratio has jumped (as the graph below from the IMF shows). This is not unexpected, but does represent a potential risk for the banks and highlights that their reliance on ECB and ELA funding will remain for some time. That is at least until they manage to deleverage significantly and (we’d imagine) write down some of their bad loans. Bloomberg reports on a potential proposal by the European Commission to alter the EU’s ‘Balance of Payments’ (BoP) facility to allow it to aid banks which may need to be recapitalised in the aftermath of next year’s ECB Asset Quality Review and the EU's bank stress tests. As a reminder, the BoP facility was originally created to aid countries with currency crises that may impact the rest of the EU or the fundamental stability of the state. It has since been adjusted to apply to only non-euro members and seen its scope widened slightly with its budget increased to €50bn due to the financial crisis. It is guaranteed by the EU budget and therefore ultimately by the member states - with the UK underwriting around 14-15%. What is the rationale behind this move? Next year’s stress tests are hopefully going to be the most stringent and comprehensive so far, yet there are fears that, without clear aid to help banks found to be in trouble, supervisors may shy away from revealing any deep problems. This is backed somewhat by the ECB’s insistence that the stress tests will not be able to be effective unless there are clear backstops for banks in place. The eurozone does have some form of backstop in the shape of the ESM which can provide aid to banks (via states) but also has a direct bank recap tool. The most likely approach would be to use Article 352 (the flexibility clause) to adjust the regulation establishing the facility. However, the facility also has a treaty base, Article 143, which specifies lending to states. For this reason, it seems unlikely that a direct recapitalisation tool could be added but a credit line which is lent to states to solely aid banks could potentially be. This could come with less or more specific financial sector conditions than other loans (for example see ESM and Spanish bank bailout). This would require unanimous approval in the Council. So far, Germany and the UK have expressed scepticism based on the fear that a backstop would reduce the pressure on banks (and their governments) to reform and clean up ahead of the tests. Yes. If it were approved it would create a collective fund to salvage banks should a member state be unable to deal with the problem alone. If the UK were to approve the move it could open up the door for future pay-outs of funds to aid other countries' banks – decisions taken under qualified majority voting. Furthermore, it also seems to be driven by events in the eurozone. Firstly, it seems an attempt to extend this centralised banking union model (to break the so-called sovereign-bank loop) to the entire EU - even though the other countries have already rejected this to a large extent. If they really wanted to join the banking union, which some might, there will be chances for them to engage directly. The creation of the fund would raise some serious questions. Will this backstop exist without strong influence over the amount of risk taken in or the relative size of banking sectors to governments across the EU? If so, surely that creates a moral hazard problem. If not, it would necessitate far greater powers over member states' financial sectors. Lastly, it highlights the level of concern around the health of many of the EU's banks. This was furthered by the EBA's recent assessment that the largest EU banks are some €70bn short of where they need to be to meet the new Basel III rules. 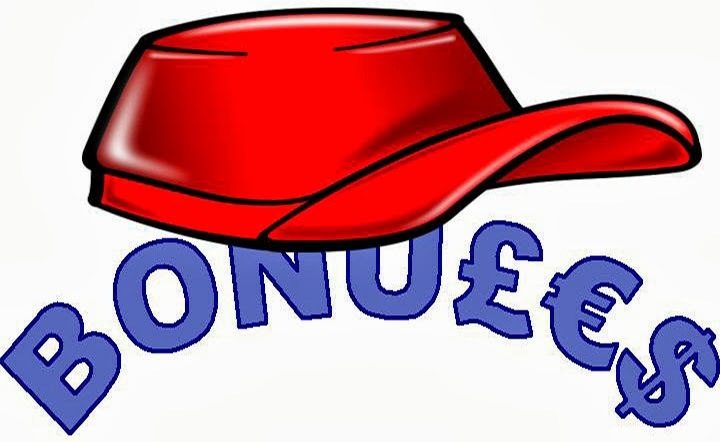 Last week, the UK launched another legal challenge at the European Court of Justice (ECJ) against an unwanted piece of financial regulation – this time, the bankers' bonus cap. This comes in the wake of some favourable legal assessment from a UK point of view, on short selling and the FTT (though both those cases are still pending), as well as a win on benchmark regulation. The CRD IV legislation transfers power to the European Banking Authority (specifically the power to regulate wages in some form). When the EBA along with other supervisors was established there were clear limits put on the powers it can have, particularly ones transferred under the single market legal base (article 114). This was also a key point in the short selling case and one that the ECJ backed the UK on. Furthermore, the use of technical standards allows a significant amount of power to the EBA officials to set the boundaries of the cap. The second key issue is the legal base itself, should something such as a wage cap fall under the single market legal base? Furthermore, should it even be allowed under EU treaties? This may come down to a question of to the extent to which the cap actually play a role in regulating the financial system (we would say not much). The next issue is related to the above. The UK claims that the law is being enacted without any significant cost benefit analysis of its impact and that it remains unfit for purpose. There is also an extraterritoriality point to be made potentially, given that all banks headquartered in the EU will have to apply the rules across their businesses around the world, thereby setting rules outside the EU. However, this home vs. host interpretation of regulation is not unheard of. (This obviously makes the plan flawed from a practical perspective although how strong a point it is legally is not clear). It highlights a growing trend that the UK is aware it has significant legal recourse on EU issues which it does not agree with. Using this effectively will be a big part of future EU engagement. As we have noted before, the EU is increasingly trying to push through a wider range of measures using single market articles. Showing the limits of this approach, as was done with the short selling ruling, will be key in defining the limits to what the eurozone in particular can push ahead with under the current treaties (though the cap isn't itself a eurozone-specific issue). If the UK is able to secure a victory or even an adjustment in the rules it will be significant since this is the first financial services issue which the UK has been directly out voted on – making it a key symbolic point. Having said all that, on this one, the UK will have a tough time. It's barely been half a year since the German anti-euro party Alternative für Deutschland (AfD) emerged onto the political scene (and we were one of the first to flag up the then-unknown party), but its ascent has been rapid. On Sunday's federal elections, AfD managed to convince two million Germans to back it. With 4.7% of the final vote, the party just narrowly missed the 5% threshold to enter the Bundestag. Had AfD made it in, it would have had over 30 seats. Age plays an interesting part in the AfD story. Had the elections been decided by younger voters, AfD would now be preparing to enter parliament. 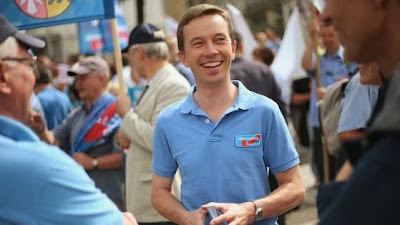 Lead by economist Bernd Lucke, the party won 6% of the overall share of votes from those aged between 18 to 24. It won the same amount from those aged between 25 - 44. Support for AfD drops to 5% in the 45-59 group, and to below 3% in the over-60's category. Now, the interesting dynamic in all this, is, of course, that AfD has been depicted by many commentators as the "Bourgeois protest party;" or as an old and boring "party of professors." But obviously something about it speaks to younger voters. "We have 20,000 members in Germany and there aren't so many professors in Germany. Our membership is coming from all stratas of the population." 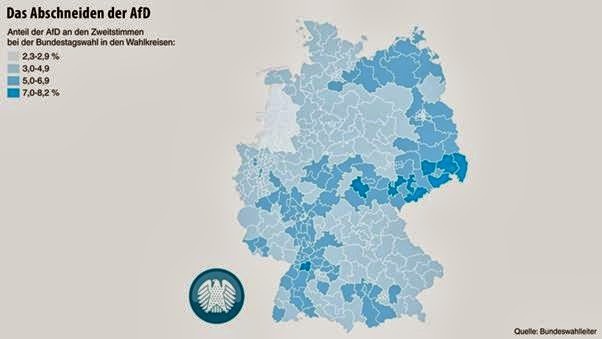 Another interesting element to highlight is that AfD won enough votes to take it over the 5% barrier, in all but one of the eastern German states. The AfD's candidate in Brandenburg, Alexander Gauland, thinks that this is because “people are not so strongly bound to parties in the east”, while another prominent AfD candidate, Konrad Adam, adds: "eastern Germans haven't got bad experiences with experiments." And indeed, if a new currency were introduced in Germany (the AfD argues against the euro), it could be easier for east Germans to stomach: it would be their fourth currency in 25 years. 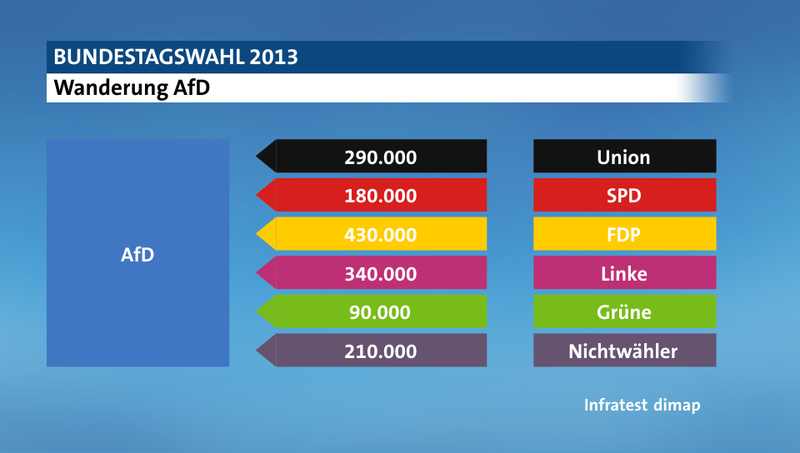 So what side of the political spectrum does AfD gets its votes from? But it looks like Lucke, (who is yet to decide whether or not he will run in the European elections in May 2014) may enjoy further success. Bear in mind that the threshold to enter the European Parliament is only 3%. In the last European elections in 2009, the CSU and Die Linke got about 2 million votes, resulting in 8 MEP seats. AfD has already shown that it can mobilise such numbers. Moreover, EU-protest parties (such as UKIP, for example) tend to perform their strongest in European elections. And while this is not to gloss over the considerable differences between UKIP and AfD as parties, this should raise expectations for AfD's showing next year. It may not have made it into the Bundestag, but we still may have a lot more to hear from AfD. As we noted in this morning’s press summary the back and forth over different coalitions and their terms has begun in Germany. So far however all comments are likely strategic and no serious movement is to be expected in the next days. SPD chairman Sigmar Gabriel already stressed that the process will take "weeks and months". There are four key stages which have to take place in the negotiations and the likely timeline for them to be concluded is at least two months. It could well be longer if any of them is delayed since there is no official time limit. Clearly then, the minimum time for a Grand coalition to be formed and finalised is likely to be around two months. This could of course be different for a coalition with the Greens, although we would imagine not markedly so. In case you wondered about just how crushing Merkel's victory in Sunday's German elections was, check this out. 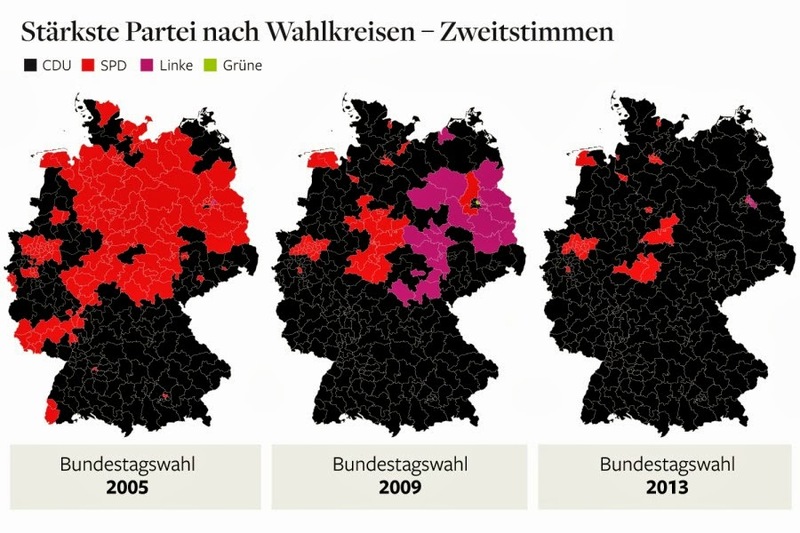 Courtesy of Die Welt, these maps have been doing the rounds on twitter, showing the strongest party for each constituency in comparison to the previous two elections. 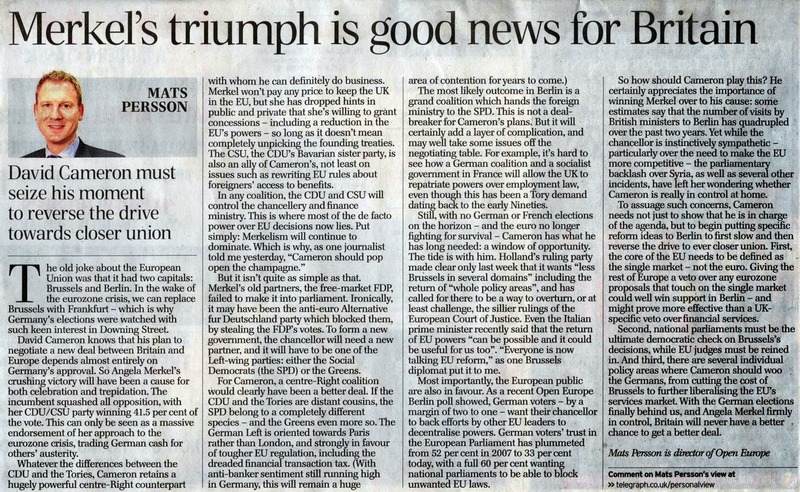 Our Director Mats Persson has an op-ed in today’s Telegraph. See below for the full text. The old joke about the European Union was that it had two capitals: Brussels and Berlin. In the wake of the eurozone crisis, we can replace Brussels with Frankfurt – which is why Germany’s elections were watched with such keen interest in Downing Street. David Cameron knows that his plan to negotiate a new deal between Britain and Europe depends almost entirely on Germany’s approval. So Angela Merkel’s crushing victory will have been a cause for both celebration and trepidation. The incumbent squashed all opposition, with her CDU/CSU party winning 41.5 per cent of the vote. This can only be seen as a massive endorsement of her approach to the eurozone crisis, trading German cash for others’ austerity. Whatever the differences between the CDU and the Tories, Cameron retains a hugely powerful centre-Right counterpart with whom he can definitely do business. Merkel won’t pay any price to keep the UK in the EU, but she has dropped hints in public and private that she’s willing to grant concessions – including a reduction in the EU’s powers – so long as it doesn’t mean completely unpicking the founding treaties. The CSU, the CDU’s Bavarian sister party, is also an ally of Cameron’s, not least on issues such as rewriting EU rules about foreigners’ access to benefits. But it isn’t quite as simple as that. Merkel’s old partners, the free-market FDP, failed to make it into parliament. Ironically, it may have been the anti-euro Alternative fur Deutschland party which blocked them, by stealing the FDP’s votes. To form a new government, the chancellor will need a new partner, and it will have to be one of the Left-wing parties: either the Social Democrats (the SPD) or the Greens. The most likely outcome in Berlin is a grand coalition which hands the foreign ministry to the SPD. This is not a deal-breaker for Cameron’s plans. But it will certainly add a layer of complication, and may well take some issues off the negotiating table. For example, it’s hard to see how a German coalition and a socialist government in France will allow the UK to repatriate powers over employment law, even though this has been a Tory demand dating back to the early Nineties. Still, with no German or French elections on the horizon – and the euro no longer fighting for survival – Cameron has what he has long needed: a window of opportunity. The tide is with him. Holland’s ruling party made clear only last week that it wants “less Brussels in several domains” including the return of “whole policy areas”, and has called for there to be a way to overturn, or at least challenge, the sillier rulings of the European Court of Justice. Even the Italian prime minister recently said that the return of EU powers “can be possible and it could be useful for us too”. “Everyone is now talking EU reform,” as one Brussels diplomat put it to me. Most importantly, the European public are also in favour. As a recent Open Europe Berlin poll showed, German voters – by a margin of two to one – want their chancellor to back efforts by other EU leaders to decentralise powers. German voters’ trust in the European Parliament has plummeted from 52 per cent in 2007 to 33 per cent today, with a full 60 per cent wanting national parliaments to be able to block unwanted EU laws. So how should Cameron play this? He certainly appreciates the importance of winning Merkel over to his cause: some estimates say that the number of visits by British ministers to Berlin has quadrupled over the past two years. Yet while the chancellor is instinctively sympathetic – particularly over the need to make the EU more competitive – the parliamentary backlash over Syria, as well as several other incidents, have left her wondering whether Cameron is really in control at home. To assuage such concerns, Cameron needs not just to show that he is in charge of the agenda, but to begin putting specific reform ideas to Berlin to first slow and then reverse the drive to ever closer union. First, the core of the EU needs to be defined as the single market – not the euro. Giving the rest of Europe a veto over any eurozone proposals that touch on the single market could well win support in Berlin – and might prove more effective than a UK-specific veto over financial services. Second, national parliaments must be the ultimate democratic check on Brussels’s decisions, while EU judges must be reined in. And third, there are several individual policy areas where Cameron should woo the Germans, from cutting the cost of Brussels to further liberalising the EU’s services market. With the German elections finally behind us, and Angela Merkel firmly in control, Britain will never have a better chance to get a better deal. Is Ed Miliband's "energy price freeze" compatible with the UK's EU commitments? 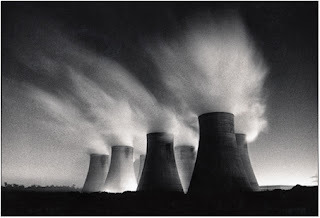 How will Ed Miliband's new Energy policies go down in the EU? At our fringe event today at the Labour Party conference - that we organised together with IPPR (write-up to follow) - we sought to answer the question, how Labour should respond to a changing Europe. Well, here's a potentially interesting twist to that question. Ed Miliband in his leader's speech earlier today promised to freeze energy prices for 20 months after 2015 if he is elected Prime Minister. Furthermore he also seemingly promised to reduce carbon emissions from the UK's energy sector to zero by 2030. Interesting ideas, both brave and potentially effective with the electorate (they can also count as real policy announcements). However, we wonder whether he has thought through the EU implications of all of this. First, it's impossible to discuss energy policy without considering the EU dimension. Although UK governments - Labour and the Coalition - have no doubt added extra requirements, much of the cost of reducing CO2 and other emissions are now locked into legally binding EU agreements. Incidentally, Ed Miliband was Energy Minister from 2008-10 when many of these policies were being developed. Capping price increases while keeping the underlying policies will do nothing for long term energy affordability. Meeting the renewables target is costly and requires significant investment - this will not be forthcoming under a price freeze and the UK is already behind schedule in terms of meeting its target. UK energy companies may also find it impossible to stomach the cost of managing both policies at once. The real question then is whether Miliband is also ready to go to Europe to renegotiate these policies to achieve affordable energy in the long-term? Secondly, is it possible for the UK to unilaterally freeze prices in the UK while championing an integrated EU single market in energy? An integrated single market is one real way to help reduce prices - and is something that we believe Labour has rightly called for in the past. Some have already questioned whether the move would be legal under EU competition law. We believe it might, just. Since there is currently no single market to break in energy but also because UK firms receive no competitive advantage from the move. Any imported energy would also face the same price cap since it is applied at the consumer level. Given the problems above though, tinkering along the edges of the plan seems likely (possibly to reduce the impact on UK energy firms) this could well create legal issues with the EU. Thirdly, did Ed Miliband really mean to commit his party to reducing UK energy carbon emissions to Zero (its worth noting he made similar suggestions last year)? The EU's already ambitious targets are to cut carbon emissions by 85 - 90% by 2050, so bringing that forward to 2030 would add a huge cost to the UK's energy bill. We wonder whether he actually means 100% of UK electricity (note, not total "Energy") should be carbon free? That could technically be possible (just), but likely at an incredible cost, and require vast amounts of investment in both nuclear and renewables. It's an interesting idea - and credit to Ed Miliband for actually trying to address an issue that will be very important to people for years to come - but we would like to see more details. But more fundamentally, it's also a reminder that, not matter how it tries, Labour won't be able to escape tough decisions on how to approach EU policy - in all its various shapes and forms. 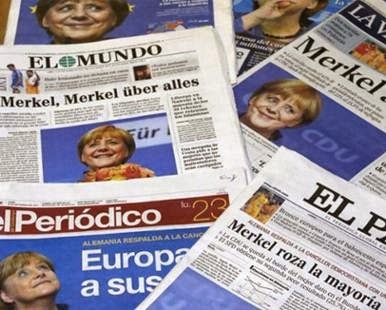 An editorial in El Pais suggests that the result “validates [Merkel’s] European theses”. 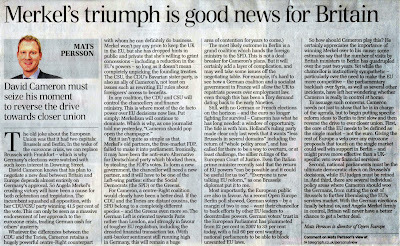 Les Echos agrees, arguing that it is “illusory” to expect a Grand Coalition to “fundamentally” shift Berlin’s approach to the eurozone. In France Les Dernieres Nouvelles D'Alsace argues that the election outcome is "unlucky for France, whose voice does not count anymore, and will only be heard again when the French economy improves". Meanwhile, Le Figaro splashes a beaming Merkel on its front page with the headline, "The Triumph of Merkel," pointing out that a victory like this has not been seen in over half a century. A leader in Dutch daily Trouw argues that Merkel was re-elected because of the German public's "reluctance to engage in big adventures." However, it adds that "for Europe, Merkel's victory is good news...Merkel believes in political and monetary entrenchment of her country in Europe - and without Germany the euro is a lost project." Meanwhile, De Volkskrant quotes an unnamed EU ambassador of a eurozone country saying that the member states are "27 poodles on the leash of Angela Merkel". 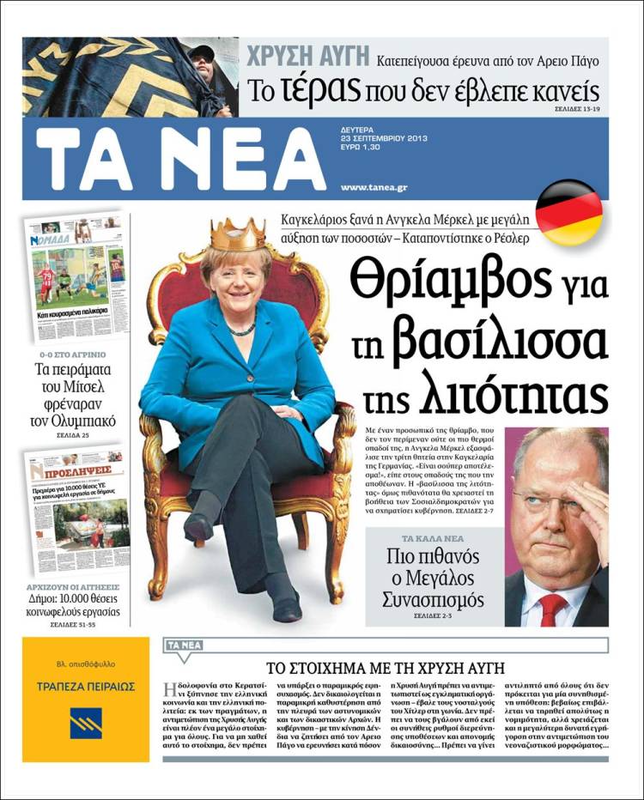 The newspaper adds: "the Empress herself stresses that she is in favour of a European Germany, and that is undoubtedly true". The paper goes on to criticise Dutch PM Mark Rutte, saying, "Mark wants what empress Angela wants. The German voter has on Sunday decided the European agenda of Mark Rutte". Belgian centre-left daily Le Soir takes a consiliatory tone, arguing: "Certainly the Greeks don't like [Merkel]. But what would Greece and the euro today be if she hadn't insisted that the Greeks must tighten the belt before receiving European funds? Who else in the European Council would have managed to keep heads cool when having to listen to the cries on the streets of "Merkel, Hitler"?" Meanwhile, Politiken from Copenhagen congratulates Merkel, while urging her to take action, saying,“The key is that the German government creates stability and firmly stands behind its support of EU and the euro... It is necessary that the new German government puts itself at the forefront of a European recovery"
Austria's Der Standard reports on Merkel's "middle-direction, mediocrity, " which "gives the Germans soundness and stability." Separately, a piece in the Telegraph argues Merkel's re-election should not lull the Germans into complacency, which could prevent it from making the necessary reforms to fix the underlying structural weaknesses in its economy. Lidové Noviny from Prague takes a more critical view of Merkel's re-election, saying that she has "brought no solutions, and the eurozone remains a risk for the lasting prosperity of Europe." The paper writes that, "It is indeed sad that the euro-sceptic party Alternative für Deutschland has narrowly failed to reach the Bundestag. This would have opened the political debate in Germany. But next year will see elections for the European Parliament and then the AfD could get a breakthrough." Polish daily Rzeczpospolita says that "a miracle is expected from Merkel: reform the EU to make it attractive for future generations. The new government has to show that it is possible in crisis-torn Europe to combine sound economic policies with growth incentives. The young generation needs a signal that it is not eternally damned to live worse than their fathers and grandfathers." Varied reactions then as expected. However, there does seem to be a consensus that, for better or worse, Merkel will continue to set the tone and agenda for Europe for some time to come.